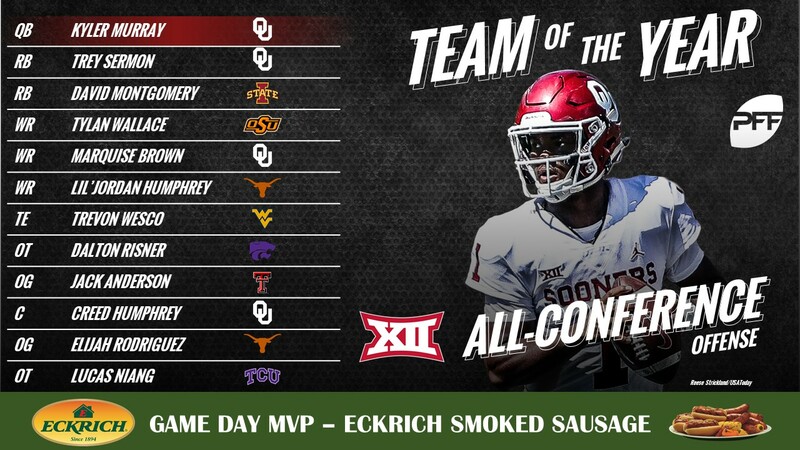 The All-Big 12 selections below are headlined by the first team with the second team listed below each position. Sermon followed in a long line of talented Oklahoma running backs and finished the season with an elusive rating f 128.8, third in the conference. There was no better deep threat in college football than Wallace, who led the country with 20 deep receptions (20-plus yards downfield) and 708 yards. Humphrey dominated the slot this year for Texas and his 22 missed tackles forced were the most among all Big 12 receivers. Wesco forced 11 missed tackles and gained 220 yards after the catch on just 24 receptions this year. Anderson had the highest run-blocking grade among all guards in the conference and allowed just one sack on pass plays. With no sacks allowed all season, Humphrey finished the season with the 12th-highest pass-blocking grade among all FBS centers. Rodriguez had the 11th-best pass-blocking grade and the fourth-best run blocking grade in the Big 12 among guards. Thanks to allowing no sacks and just seven pressures, Niang had the second-highest pass-blocking efficiency mark among Big 12 tackles (behind Risner) at 99.2. Collier’s pass-rushing productivity mark of 8.9 was the second-highest among Big 12 edge defenders this season. A run-game nightmare, Omenihu had the second-most run stops among Big 12 edge defenders for a third-best run stop percentage of 7.8%. No Big 12 interior defensive linemen had a better pass-rushing productivity score than Bigelow Jr.’s 4.8. 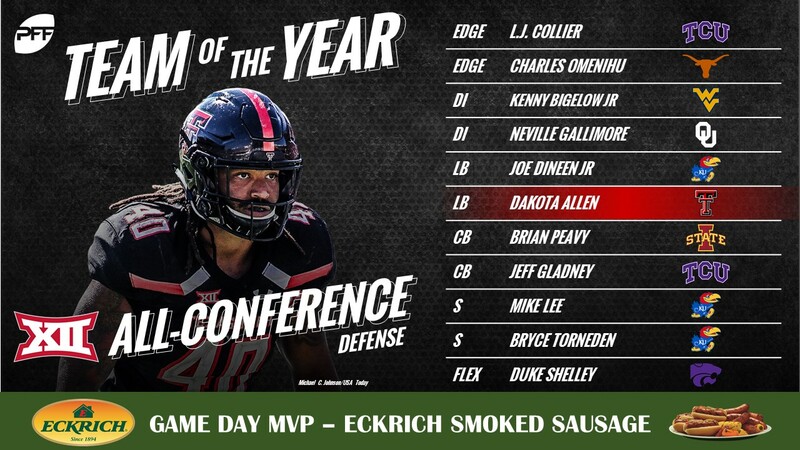 Gallimore made 16 solo run stops this year, resulting in a run-stop percentage of 6.8% that ranked seventh among interior defensive linemen in the conference. Dineen Jr. made a ridiculous 58 solo run stops, the second-most in the entire NCAA this season as he once again led the Power-5 linebackers in total defensive stops. Allen’s 90.9 run-defense grade ranked eighth in the NCAA among all qualified linebackers. Gladney averaged 15.7 coverage snaps per reception allowed this season, despite being targeted every 5.9 coverage snaps. Lee made 15 solo run stops this season, good for an impressive run stop percentage of 5.4%. Torneden made 33 total solo stops this season which was the second-most among all safeties in the Big 12. QBs throwing at Shelley had a rating of just 52.0 on the season, the lowest mark among outside corners in the Big 12. Hatfield was perfect on 55 extra point attempts, as well as a perfect 7-of-7 on kicks between 40-49 yards. Galitz average 42.4 yards per punt and had 21 punts land inside the 20, while averaging a Big 12-best 4.16 seconds of hangtime per punt. Brown was the highest-graded kick returner in the Big 12 by a wide margin, averaging 24.0 yards per return with a long of 86, and no muffed kicks all season. Lamb’s 215 total punt return yards were the most in the conference as he averaged an impressive 14.3 yards per return this year while not muffing a single punt.